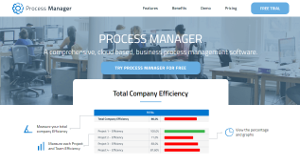 Process Manager is a robust, feature-rich business process management platform that is based in the cloud and offers businesses tools, features, charts, and reports they need to further optimize their business processes and make them more manageable. The software is designed to help companies measure, analyze, and maximize their business processes, with the ultimate goal of boosting revenue and driving growth. Process Manager is also developed to streamline these business processes and drive efficiency in those companies. With Process Manager, team leaders, and business owners have a platform that lets them engage directly in the improvement of their business processes. With reliable data and highly actionable insights, they can improve the efficiency of their processes, improve workflows and bolster productivity by teams and individual users. Process Manager enables businesses and organizations measure and analyze their business processes with the aim of greatly improving productivity and efficiency while driving down costs, identifying issues that hamper these processes, and eliminating them from the picture. The software significantly accelerates business processes, which results in more revenue and growth for its users. With Process Manager, business processes are significantly streamlined. As productivity and efficiency are increased at all levels across the entire organization, Process Managers gives its users a distinctive edge over their competition. On top of that, all users are provided with a rich feature set including tools, dashboards, and reports. That means top management personnel, company owners, managers, team leaders, and day-to-day users have immediate access to reliable and updated information from which they can derive high-value insights to guide their actions and decisions. From their dashboards, users can see total company efficiency and other information pertaining to their operations, business goals, and performance among others. Process Managers display all your company targets as well as targets that you and your team have already achieved. The software generates reports for each target and project, detailing specifics that require attention and provide users the necessary information to devise more effective processes speed up the realization of their business goals. What Problems Will Process Manager Solve? Measuring time of a process and items within that process: Johns job is to process Invoices for a Shared Services Company. It would normally be very difficult to calculate his time taken to process an Invoice and especially difficult to measure the time of and each Item within that one invoice. By using Process Manager’s simple task manager, he doesn’t have to worry about estimating his time. The Process Managers algorithm computes the productivity in a particular process, and items within that process. It provides detailed information and reporting of the productivity of each process, productivity of an individual user, and the productivity of a particular team. Calculating the Efficiency of Users, Team and Company: In most cases it is particularly difficult in calculating the companies overall efficiency, not to mentions individual users and teams. Process Manager calculates the companies overall efficiency, and benchmarks this with other teams in the company. Process Manager, provides comparisons regarding: An Individual and or Different processes; One or Many teams; Individual user and or employees and the calculation of the process efficiency index, based on benchmarks. Up to 10% Increase in Efficiency: Previous clients, in the Shared Services, Financial Sector have seen up to 10% increase of efficiencies, based on the initial implementation. Using Process Manager as a whole Business Process Management Software can help companies manage business processes, individual process tasks and can provide reports that enable managers and team leader to make better decisions and therefore improve efficiencies, with a view to decreasing costs and improving the companies overall profits. Features: Efficiency, Benchmarks, CEO Reports, Manager Reports, Team Leader Reports, Process Reports, SAP Integration, Enterprise Resource Planning, Productivity Benchmark, Continuous Process Improvement, Cloud Solution. If you are considering Process Manager it may also be sensible to examine other subcategories of Best Business Process Management Software gathered in our base of B2B software reviews. Organizations have different needs and requirements and no software solution can be just right in such a condition. It is useless to try to find a perfect off-the-shelf software system that fulfills all your business requirements. The intelligent thing to do would be to adapt the application for your special needs, staff member skill levels, finances, and other factors. For these reasons, do not rush and subscribe to well-publicized popular systems. Though these may be widely used, they may not be the perfect fit for your unique needs. Do your research, investigate each short-listed platform in detail, read a few Process Manager reviews, call the vendor for explanations, and finally settle for the app that offers what you require. We realize that when you make a decision to buy Business Process Management Software it’s important not only to see how experts evaluate it in their reviews, but also to find out if the real people and companies that buy it are actually satisfied with the product. That’s why we’ve created our behavior-based Customer Satisfaction Algorithm™ that gathers customer reviews, comments and Process Manager reviews across a wide range of social media sites. The data is then presented in an easy to digest form showing how many people had positive and negative experience with Process Manager. With that information at hand you should be equipped to make an informed buying decision that you won’t regret. What are Process Manager pricing details? What integrations are available for Process Manager? If you need more information about Process Manager or you simply have a question let us know what you need and we’ll forward your request directly to the vendor.